In May 2015, over 200,000 saiga antelopes in central Kazakhstan died in just three weeks, more than a third of the world’s saiga population. Researchers narrowed the cause down fairly early to a bacteria that up until that point had been living harmlessly in the saigas’ tonsils, but why was it suddenly fatal and so devastating? A new study published in Science Advances presents the findings of researchers working to combat the die-off and to prevent a future catastrophe from happening again. Research by a diverse team, including members of our partners at Saiga Conservation Alliance, showed that many separate factors contributed to make the situation so devastating. Climatic factors of increased humidity and warmer air temperature may have triggered the bacterial invasion of the saiga, poisoning their bloodstream and leading to death in just a few hours. The record of past die-offs showed that they were more probable in similar weather. Mass die-offs have happened in the recent past but no evidence has been found for any before the 1980s. According to Richard Kock, a professor at the Royal Veterinary College in London and an author of the paper, “One possible explanation might be that climate change is driving these events.” Going forward, conservationists will be paying closer attention to how climate change affects saigas, especially those living in an unusually wet and warm environment. In the 1980s, two thirds of the world’s saiga population were lost, and in 2010, one third. During all of these events they tended to occur during calving seasons. Saigas typically give birth to unusually large calves and birthing them in their harsh environment takes a lot out of the mothers, making them psychologically stressed and more susceptible to disease. These factors make high levels of mortality expected, but recent history suggests that the die-offs are happening more frequently, making saigas vulnerable to extinction. 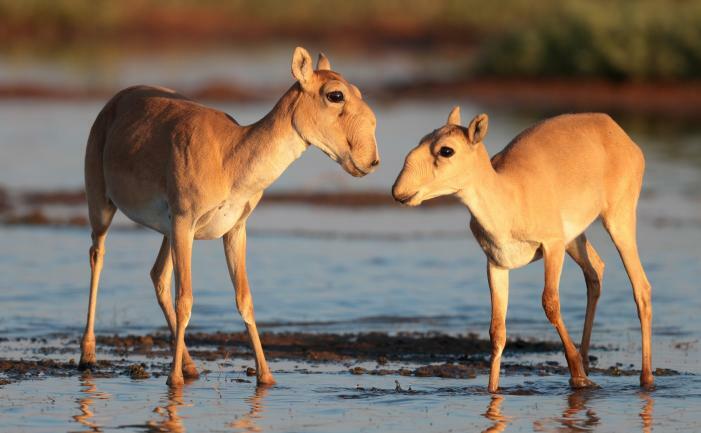 Not long after the major die-off of 2015, disaster struck again for another saiga population. In 2017, 60% of the Mongolian saiga population was lost after they contracted a virus infection from livestock. High levels of poaching since the 1990s and habitat loss and fragmentation are also straining an already dwindling population throughout their range. Saigas are able to bounce back quickly, they are remarkably tough and fast breeders but another mass die-off could reduce numbers to a level where recovery is no longer possible. Conservationists are tackling the threats facing the species with a “One Health” approach. This means they’re looking at the wildlife, livestock, and human impacts that have driven disease emergence in saiga populations and to understand the wider significance of the die-offs. Saigas have been here since the Ice Age, to see them go extinct would be a tragedy, but by learning everything they can from the past, conservationists can be ready for whatever the future brings for this ancient species. Click here for more information from our partners at Saiga Conservation Alliance and for a link to the complete report.